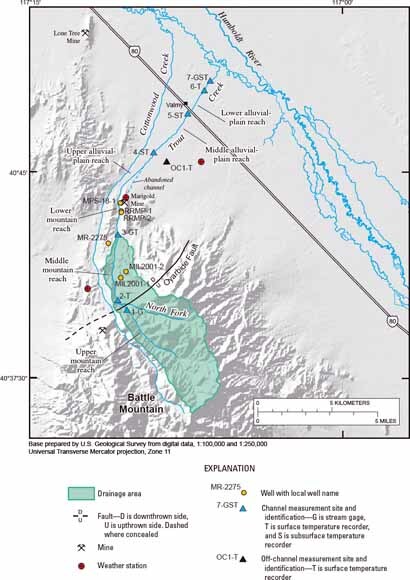 General features, drainage area, active mines, channel measurement sites, selected wells, and precipitation stations in vicinity of Trout Creek, north-central Nevada (from figure 2). Ground water is abundant in many alluvial basins of the Basin and Range Physiographic Province of the western United States. Water enters these basins by infiltration along intermittent and ephemeral channels, which originate in the mountainous regions before crossing alluvial fans and piedmont alluvial plains. Water also enters the basins as subsurface ground-water flow directly from the mountains, where infiltrated precipitation recharges water-bearing rocks and sediments at these higher elevations. Trout Creek, a typical intermittent stream in the Middle Humboldt River Basin in north-central Nevada, was chosen to develop methods of estimating and characterizing streambed infiltration and ground-water recharge in mountainous terrains. Trout Creek has a drainage area of about 4.8 × 107 square meters. Stream gradients range from more than 1 × 10–1 meter per meter in the mountains to 5 × 10–3 meter per meter at the foot of the piedmont alluvial plain. Trout Creek is perennial in short reaches upstream of a northeast-southwest trending normal fault, where perennial springs discharge to the channel. Downstream from the fault, the water table drops below the base of the channel and the stream becomes intermittent. Snowmelt generates streamflow during March and April, when streamflow extends onto the piedmont alluvial plain for several weeks in most years. Rates of streambed infiltration become highest in the lowest reaches, at the foot of the piedmont alluvial plain. The marked increases in infiltration are attributed to increases in streambed permeability together with decreases in channel-bed armoring, the latter which increases the effective area of the channel. Large quartzite cobbles cover the streambed in the upper reaches of the stream and are absent in the lowest reach. Such changes in channel deposits are common where alluvial fans join piedmont alluvial plains. Poorly sorted coarse and fine sediments are deposited near the head of the fan, while finer-grained but better sorted gravels and sands are deposited near the foot. All flow in Trout Creek is lost to infiltration in the upper and middle reaches of the channel during years of normal to below-normal precipitation. During years of above-normal precipitation, streamflow extends beyond the piedmont alluvial plain to the lower reaches of the channel, where high rates of infiltration result in rapid stream loss. The frequency and duration of streambed infiltration is sufficient to maintain high water contents and low chloride concentrations, compared with interchannel areas, to depths of at least 6 m beneath the channel. Streamflow, streambed infiltration, and unsaturated-zone thickness are all highly variable along intermittent streams, resulting in recharge that is highly variable as well. Average annual ground-water recharge in the mountainous part of the Trout Creek drainage upstream of Marigold Mine was estimated on the basis of chloride balance to be 5.2 × 105 cubic meters. Combined with an average annual surface runoff exiting the mountains of 3.4 × 105 cubic meters, the total annual volume of inflow to alluvial-basin sediments from the mountainous part of the Trout Creek is 8.6 × 105 cubic meters, assuming that all runoff infiltrates the stream channel. This equates to about 7 percent of average annual precipitation, which is about the same percentage estimated for ground-water recharge using the original Maxey-Eakin method. download this report as a 39-page PDF file (pp1703k.pdf; 8.3 MB).